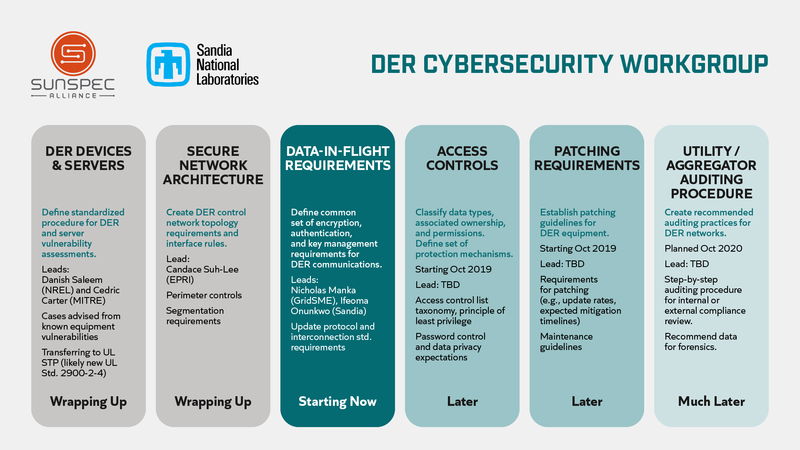 The SunSpec Alliance Distributed Energy Resource (DER) Cybersecurity workgroup focuses on current issues in the U.S. DER industry and is supported by projects funded by Sandia and the California Energy Commission. If you are a SunSpec Alliance member, click on the button below to enroll in the program. If you are not a SunSpec member but would like to participate, follow the non-member registration to complete an IP Agreement. The mission of the SunSpec DER Cybersecurity Working Group (SunSpec DCWG) is to support the deployment of Distributed Energy Resources (DER) by defining best practices in cybersecurity for DER and driving the concepts that emerge from these best practices into relevant national and international standards. To contribute effectively, participants should review the revised IEEE Std. 1547 as it pertains to communication and interoperability. Initial work is bounded by requirements put forth by U.S. states that are rolling out advanced DER regulations including California (Rule 21) and Hawaii (Rule 14H). Some of the international standards we may reference or influence include those published by the Institute of Electrical and Electronics Engineers (IEEE), International Electrotechnical Committee (IEC), Internet Engineering Task Force (IETF), American National Standards Institute (ANSI), the International Standards Organization (ISO), National Institute of Standards and Technology (NIST) Internal/Interagency Reports (NISTIR), North American Electric Reliability Corporation (NERC), CIGRE (International Council on Large Electric Systems) Reports, Federal Information Processing Standard (FIPS), Department of Homeland Security (DHS) Industrial Control Systems Cyber Emergency Response Team (ICS-CERT), and the Information Security Forum (ISF). Invitation-only sub-workgroup meetings of experts that convene on a more frequent schedule to define best practices and standards in particular DER cybersecurity areas. To contribute effectively, participants should review the revised IEEE Std. 1547 as it pertains to communication and interoperability. Initial work focuses on issues surfaced by recent changes to California (Rule 21) and Hawaii (Rule 14H).